Custom printed Durapole blade flex flags are the perfect solution for businesses looking to draw in more customers, promote an event or as a general promotional and branding tool. These printed banners are a stylish aerodynamic shaped flag with a large print area for your message. A composite fibre pole supports the top curve to hold the shape allowing the lower half to move in the wind to attract attention! With award winning full colour printing these vibrant advertising flags flap in the wind to grab the viewers attention. WindBlade banners are extremely versatile, waterproof, durable and easy to transport and can be used outdoors or indoors. Our flags are printed and manufactured on our premises, there is no 'middle man' so we can guarantee you the best quality, great turn around and expect advice. Promote your brand and attract new clients. Cost effective and with easy to update prints. Full colour award winning dye sublimation printers. Ultra strong light weight composite fibre poles. FREE Deluxe carry bag included. FREE initial sample printed on the actual fabric prior to production if required. Custom shapes made to order. Blade banners are light-weight and can be assembled in seconds with a range of mounting options. Digitex is the leader in Full Colour Digital Fabric Printing. We have won 15 Gold awards in the New Zealand pride-in-print awards including four in 2009. We are the only printers in New Zealand to have won gold awards for DIGITAL FLAG PRINTING using our twin print process! Talk to us about Pantone colour matching. At Digitex we only use the best inks, Our sublimation ink is manufactured by the worlds leading ink manufacturer in Italy, to give you a vibrant durable lasting print. We also offer 6 different types of print processes to suit your needs. 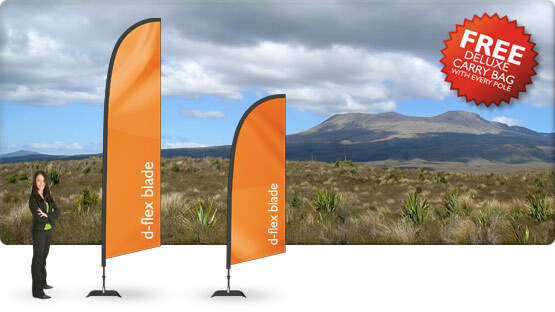 d-flex custom blade flags have many uses. d-flex custom blade flags are also known as Wing Banners, Flexi Flags, WindBlade Flags, Feather Banners. Made from carbon-fibre composite which is flexible, has no ‘memory’ and is superior to aluminium poles. The tip also includes a large round protector to prevent perforation of the sleeve.